Watching the video of skier Eddie "the Eagle" Edwards complete his jump at the 1988 Calgary Winter Olympics and punching the air, you'd think he had won the 90m event instead of being placed last. Meeting him nearly three decades later, that infectious enthusiasm is still very much on display - this time because a film telling his life story is being released. But if it was a long road to Calgary and becoming the first competitor to represent Great Britain in Olympic ski jumping, it's been an even longer one to bring the tale to the big screen. 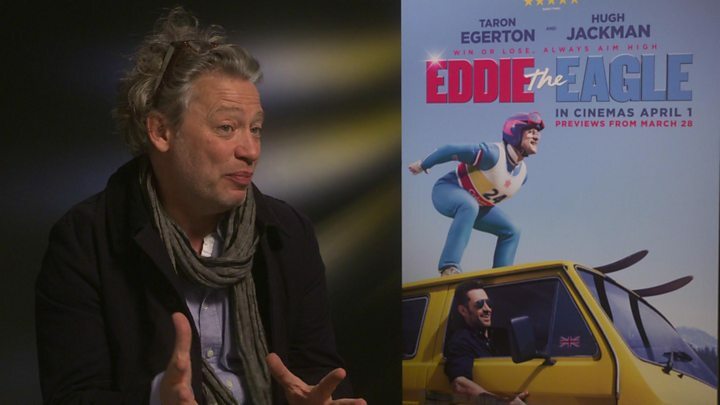 Seventeen years after the idea was first mooted, Taron Egerton donned Edwards's famous glasses to take on the title role, with Hugh Jackman and Christopher Walken co-starring and Dexter Fletcher in the director's chair. But one person you won't see in the film is Edwards himself - much to his disappointment, as he explains. What did you think when the idea of a film was first mentioned? I was gobsmacked when they rang me 17 years ago and asked if they could make a film about my life. Because they'd made Cool Runnings, about the Jamaican bobsleigh team (who also competed in 1988), I didn't think they would make a film about the same Olympics. And not only that, they've done an incredible job. When I saw the film for the first time, I was just blown away. I cried from the moment it started to the moment it finished. Was it strange seeing a fictionalised version of your life? There's a certain amount of artistic licence, but not that much because they've used things to symbolise bits of my life. So I recognised everything. It brought back so many memories - sharp memories. Calgary, although it was 25 years ago, I can remember that like it was yesterday. But with the opening credits, me as a child growing up and doing things that I did, it brought up so many memories I don't really talk about. I only talked about it 17 years ago when I spoke to scriptwriters. What was it like seeing the film being made? They invited me out to Garmisch, where they were filming a lot of the ski jumping scenes, and I walked on set. I met Hugh Jackman for the first time - he rang me a few times on the mobile and we had a chat, but this was the first time I met him face-to-face. And then I met Taron, dressed as me. And it was like looking in the mirror. He looked just like I looked 28 years ago when I was 24. He had the jaw, the moustache, the glasses, the hairstyle - everything. And it was incredible. He did such a great job. He sounded like me, he had my mannerisms. When I watch the film, he makes it so easy to watch because he had me down to a tee. He's a fantastic actor - he'd done a lot of research and he was spot on. Were you not tempted to play a part in the film yourself? I was hoping I would! I was hoping I would be a bit like Alfred Hitchcock - he gets a cameo in all his films. I would have loved to have been… even if I was just working in the restaurant, or a fellow ski jumper walking along. I would have loved to have been in the film - but they never asked me, and I'm gutted that I'm not in it. Maybe the sequel, I hope. I'm hoping to write a new book. My little book after Calgary was light-hearted stories about getting to Calgary - hopefully, the new book will have that in and the blood, sweat and tears, the fight, the struggle, and what happened after Calgary and bringing it all up to date. I'm also looking at a theatre tour and then lots of other opportunities that I hope may come my way in the next year or two. I'll just grab them with both hands and see where they take me. I just hope the next 50 years will be as exciting as the last 50 years. For me, getting to the Olympic Games was an incredible experience. It was my dream, my ambition to get there and I just loved being there. But becoming Eddie the Eagle was just a bonus. 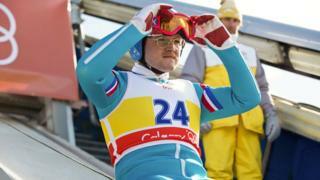 Eddie the Eagle is on general release.